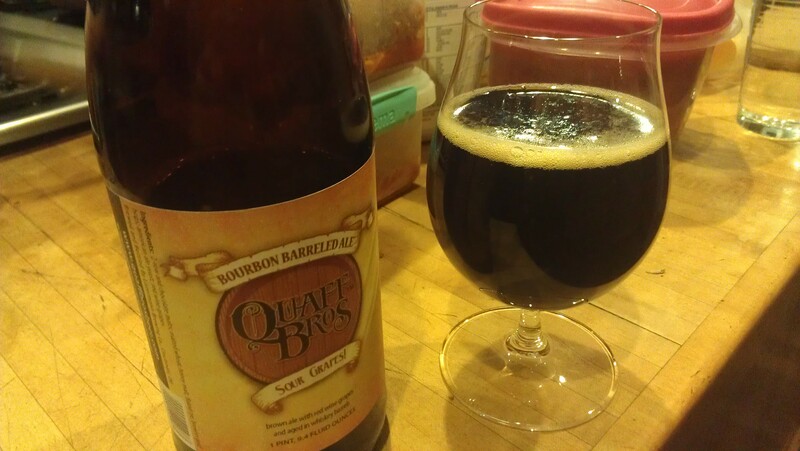 It certainly can not be denied that Quaff Bros puts out some interesting beers. All barrel-aged, their portfolio runs from wheat wines to IPAs, brown ales to stouts. Before now, however, they had yet to make anything sour. Luckily for all of us Cincinnati-area beer drinkers, fate intervened and soured a beer for them. While aging a brown ale in a Four Roses barrel (for what I assume was for Brown Chicken Brown Cow), some wild yeast and various other critters went to work on it and soured it. In a stroke of magnificent luck, rather than ruining the batch, it just created a new beer. 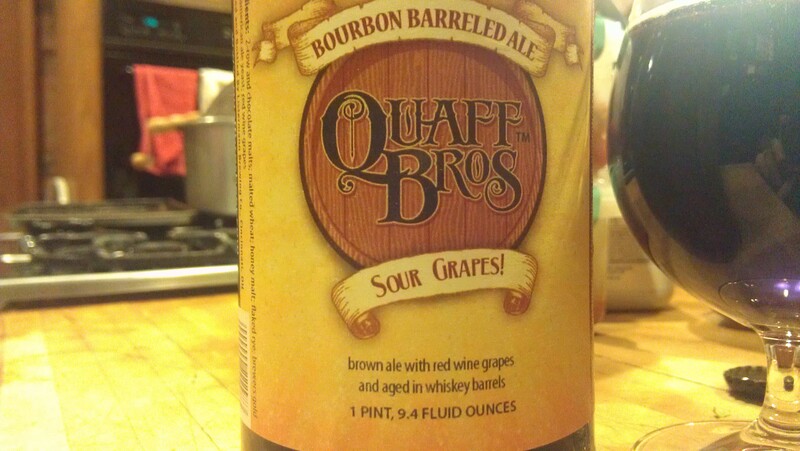 Quaff Bros ran with it and added some Sangiovese grape juice to add some extra fruit character and complexity. The result is easily one of the most unique beers I’ve ever tried, and not just locally. Sour Grapes essentially looks like a brown ale, porter, or any beer that falls within the dark brown spectrum. It’s very dark brown with slightest red tint around the edges when held up to the light. The small, fizzy Coca-Cola head dissipates quickly. That’s all I’m going to write about what it looks like because, frankly, I don’t really care and neither should you. I was drinking it, not judging it. Spaghetti in the background was not included in tasting notes. The smell on this beer is B-A-N-A-N-A-S (figuratively, of course). Right away bourbon and oak hit you, followed by a juicy red wine grape smell and a little vanilla from the barrel treatment at the end. It smells almost like if someone mixed bourbon and red wine in a glass for you and, by some stroke of olfactory Willy Wonka magic, it ended up complex and nice rather than the disgusting mess you would expect from the general premise. It is certainly all over the place, but in a good way, if that makes any sense. The taste sweet and sour, some dark grain complexity, but no roast at all. The base beer is dominated big time by bourbon, with the side kicks red wine, grapes, and some oak. Much like the smell, the flavor is largely a wine and bourbon lovechild (again, in a good way). This beer is sour without being overly so; great balance between the sweet and sour. It’s more tart that mouth-puckering sour. Think sour cherries, not Warheads. The only downside I get out of the taste is a slight bit of buttery-ness; I’m assuming from the barrel. It wouldn’t be out of place with a normal barrel-aged beer, but when combined with the sour, it’s a little awkward. Medium bodied with tingly carbonation. Should you buy this? Yes, with quickness, particularly if you enjoy sour beers, wine, bourbon, or just want a unique experience. I can’t promise you that you’ll like it, particularly if you don’t like the things I just mentioned, but I thought it was great. People who going into it expecting a brown ale with a touch of unusual complexity need not apply. Between the bourbon, grape juice, and souring, the base beer has been bastardized beyond all recognition. That may be a problem in some cases, but in this one it just works. I’d recommend splitting it with someone; it took me a couple hours to finish my bottle. If you’re interested in picking up a bottle (or two like me), hop to it. The Party Source’s website shows only 22 bottles left in stock.